There seems to be more interest in two-bay NASes lately, particularly in the under $200 space. Buffalo fielded two strong entries in its LinkStation 420 and 421e earlier this year. And even Synology joined the party more recently, departing from its usual stratospheric pricing with the DS214se. 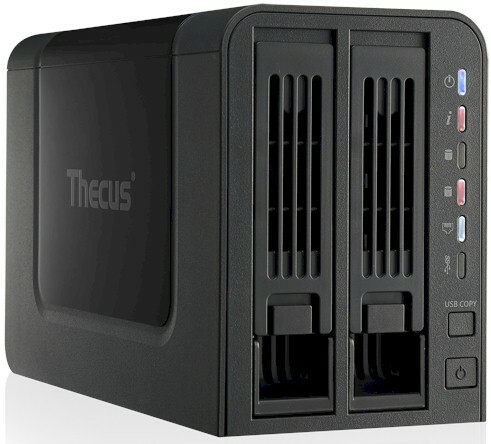 Thecus apparently decided it was time to jump into the pool and recently sent us its new entry-level N2310. The N2310's all-plastic black enclosure might put off those who insist on lots of metal in their NASes. Even the drive trays (with holes for both 2.5" and 3.5" drives) are all plastic, except for the metal spring that pops up the ejector lever. My 3.5" WD Red drives fit snugly enough in the trays that I didn't even bother screwing them down. The front and rear panel callout diagram below shows a basic set of indicator lights on the front panel and power, USB 2.0, 3.0 and Gigabit Ethernet ports on the rear. You can't see the internal buzzer / beeper, which I think all NASes should have. Sorry to disappoint, but I couldn't get a picture of the N2310's innards. I got as far as removing the two screws on the rear panel. But then trying to pry or slide the cover off only resulted in so much creaking and popping that I didn't want to risk cracking the cover. However, Thecus' specs provided the key information that that 2310 is based around an Applied Micro APM86491 clocked at 800MHz, mated with 512 MB of DDR3 RAM. The APM86491 seems a capable little SoC, with a single PowerPC 465 core and two each USB 3.0 , PCIe Gen 2, SATA II and Gigabit Ethernet ports. The 2310's key components are summarized in Table 1 along with the Thecus N2560. I also threw in the Buffalo LinkStation 420, which is more directly comparable in price. We used two WD Red 3 TB (WD30EFRX) drives loaned by WD for testing. Power consumption measured 13 W with the two drives spun up. Considering that Thecus makes a big point of touting its "Energy Efficient: 5W" operation, I was surprised to not find an idle drive spindown control. I suppose it doesn't matter, since I have found that Thecus' implementation doesn't reliably spin down the drive in other models I've tested. I rated the 2310's noise as low, with mostly drive motor noise audible in my quiet home office, even under heavy testing load. The 2310 runs ThecusOS 6, which Scott covered briefly in his N2560 review and Craig covered in depth in his ThecusOS 6 review. There is also Thecus' OS6 Live Demo if you'd like a test drive. The N2310's features are a bit different from the N2560's. So the next three images show all the Control Panel icons. Like, the N2560, the N2310 doesn't support all the apps shown in Thecus' App Center. In fact, the N2310 isn't included in the Select by model dropdown list. This could be an omission, since app installation appears to be supported. The NAS Application screenshot below shows the apps that are supported. Like the N2520 and N2560, the N2310 don't support iSCSI. I also could not get it to recognize my standard rsync target when I tried to run rsync backup tests.